Lincoln Children's Books, 9781845079291, 32pp. 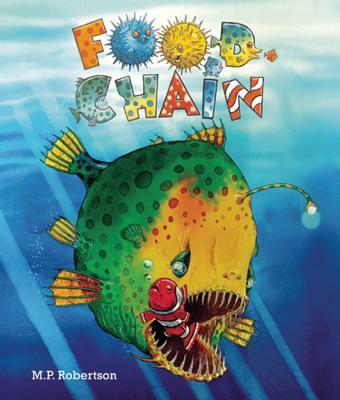 This simple, vivid story follows the food chain created when a naughty boy throws a goldfish down the toilet: it reaches the sea and is soon eaten by a larger fish, and it in turn is eaten by a larger fish ... The chain eventually works its way round in a full circle with dramatic results. A memorable picture book from the successful author of many picture books. M. P. Robertson is an internationally acclaimed author and illustrator of children's books. His many books include The Egg, The Dragon Snatcher, Frank 'n' Stan, Food Chain, Hieronymus Betts and His Unusual Pets, and Ice Trap!, written by Meredith Hooper. He lives with his family in Wiltshire, U.K. The wonderful illustrations and dark humour will delight youngsters. My favourite part for this 10/10 read was the last page - you don't mess with a family of fish with sharp teeth!